This example shows how to generate a standalone application from MATLAB®. You package the prewritten function that prints a magic square to the command prompt of a computer. MATLAB Compiler™ produces an installer that installs both the standalone application and all the required dependencies on a target system. The target system does not require a licensed copy of MATLAB. In MATLAB, examine the MATLAB code that you want deployed as a standalone application. For this example, open magicsquare.m located in matlabroot\extern\examples\compiler. At the MATLAB command prompt, enter magicsquare(5). On the MATLAB Apps tab, on the far right of the Apps section, click the arrow. In Application Deployment, click Application Compiler. Alternately, you can open the Application Compiler app by entering applicationCompiler at the MATLAB prompt. In the MATLAB Compiler project window, specify the main file of the MATLAB application that you want to deploy. In the Main File section of the toolstrip, click . In the Add Files window, browse to matlabroot\extern\examples\compiler, and select magicsquare.m. Click Open. The function magicsquare.m is added to the list of main files. Runtime downloaded from web — Generates an installer that downloads the MATLAB Runtime and installs it along with the deployed MATLAB application. Runtime included in package — Generates an installer that includes the MATLAB Runtime installer. For every release, the first time you select this option, you are prompted to download the MATLAB Runtime installer. If you do not have internet access, you should order a CD of the current version of MATLAB Runtime installer from MathWorks®. Application information — Editable information about the deployed application. 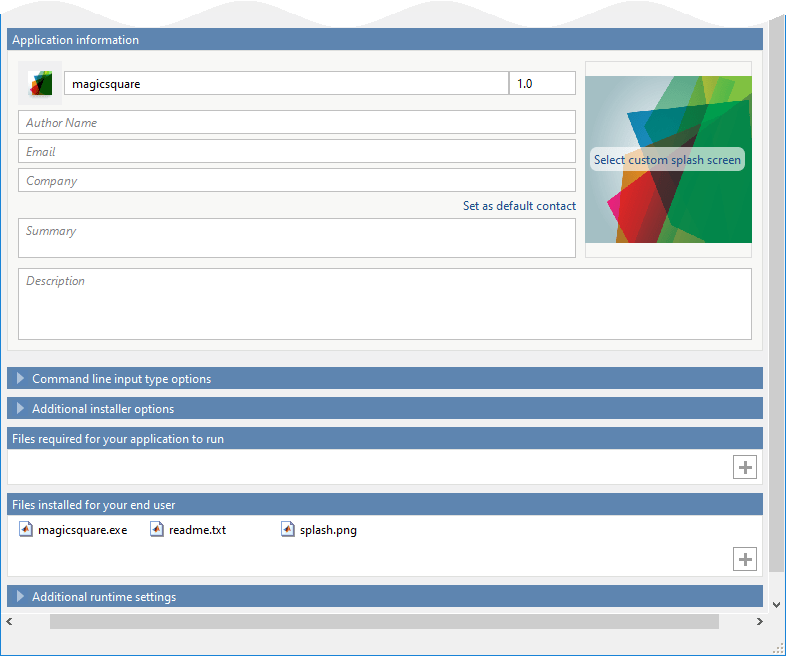 You can also customize the standalone applications appearance by changing the application icon and splash screen. The generated installer uses this information to populate the installed application metadata. See Customize the Installer. Command line input type options — Selection of input data types for the standalone application. For more information, see Determine Data Type of Command-Line Input (For Packaging Standalone Applications Only). Additional installer options — Edit the default installation path for the generated installer and selecting custom logo. See Change the Installation Path . Files required for your application to run — Additional files required by the generated application to run. These files are included in the generated application installer. See Manage Required Files in Compiler Project. See Specify Files to Install with Application. Additional runtime settings — Platform-specific options for controlling the generated executable. See Additional Runtime Settings. In the Package dialog box, verify that Open output folder when process completes is selected. When the packaging process is complete, examine the generated output. Three folders are generated in the target folder location: for_redistribution, for_redistribution_files_only, and for_testing. For further information about the files generated in these folders, see Files Generated After Packaging MATLAB Functions. PackagingLog.txt — Log file generated by MATLAB Compiler. To install the standalone application, in the for_redistribution folder, double-click the MyAppInstaller_web executable. The file extension varies depending on the platform on which the installer was generated. If you want to connect to the Internet using a proxy server, click Connection Settings. Enter the proxy server settings in the provided window. Click OK.
To complete installation, follow the instructions on the user interface. On Linux and Mac OS X, you do not have the option of adding a desktop shortcut. Navigate to the folder into which you installed the application.